As the weather gradually heats up, I start looking forward to spring brunches, outdoor gatherings, and most importantly – berry season! We aren’t quite there yet, but it is still time to lighten up our party menus with bright, fresh flavors and cakes. You know, the types of dishes and treats perfect for an upcoming bridal brunch or Mother’s Day tea – less decadent than the ones we crave come fall or deep into winter. 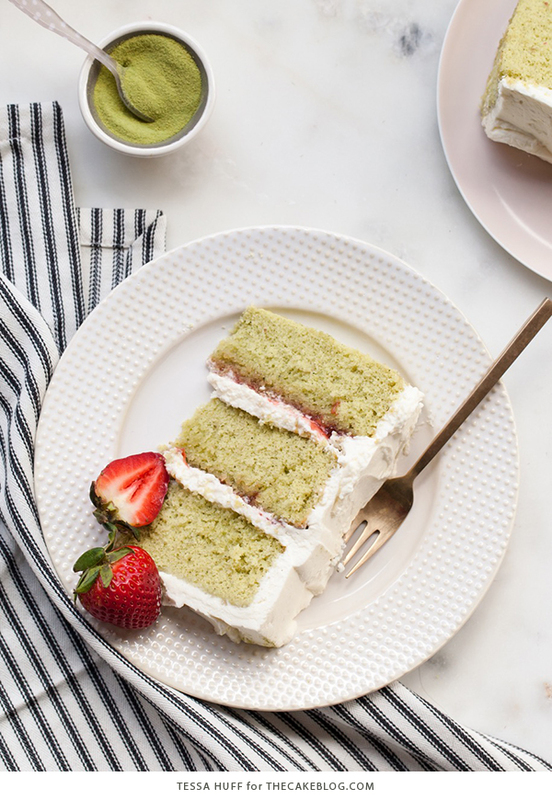 Today’s cake makes for the perfect transition from winter to spring with its light sponge cake, sweetened berry filling, and whipped frosting: a Matcha Strawberry Cake! Some of you might be thinking “what the heck is ‘matcha’?” and “why is that cake green inside?” Matcha is a type of Japanese green tea that has been ground into a powder, unlike most teas that stay in leaf-form. To drink it, matcha is blended with hot water instead of needing to be steeped. In a recipe, like in this cake, it is mixed straight into the batter to give a delicate green tea flavor and vibrant color. And speaking of Japan and spring, it also happens to be the country’s iconic cherry blossom (or sakura) season right about now. I’ve never been, but I hear it is magical – pink petals dancing from the sky everywhere! The base of this creation is a genoise cake. A genoise is a sponge cake that relies purely on slightly heated then whipped whole eggs instead of chemical leaveners (like baking powder or baking soda) for its signature “lift.” If baked correctly, it is light, fluffy, and will rise into a not-too-sweet yet versatile cake. Think of it as a fancy-pants sponge cake, but made with melted butter instead of oil. Genoise cakes can be baked as layer cakes (as I’ve done here), but are also the base of many French patisseries (either as a single cake round or baked in a sheet and cut for individual desserts). As with many French pastries, genoise cake can be a bit fussy, so be mindful when mixing (see notes below). Genoise cakes are fairly mild in flavor yet very versatile. In this case, even the delicate flavors of the added matcha powder are able to shine through. They can be subject to drying out, but act like sponges to simple syrups and other flavouring agents. I brushed on a generous about of vanilla bean syrup to add extra flavor and moisture to each layer before I spread on the strawberry jam and cream cheese whipped cream. 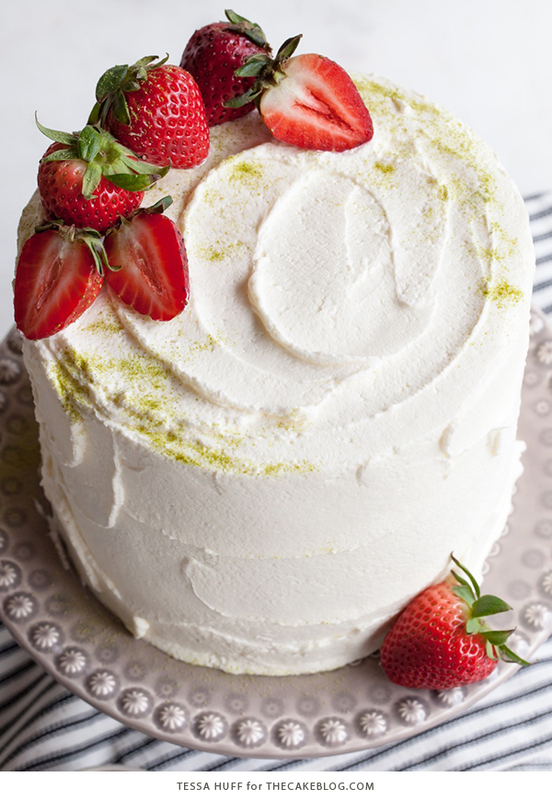 Now, if you thought the star of the this cake was the fancy-pants matcha genoise, then let me introduce you to this cream cheese whipped cream! 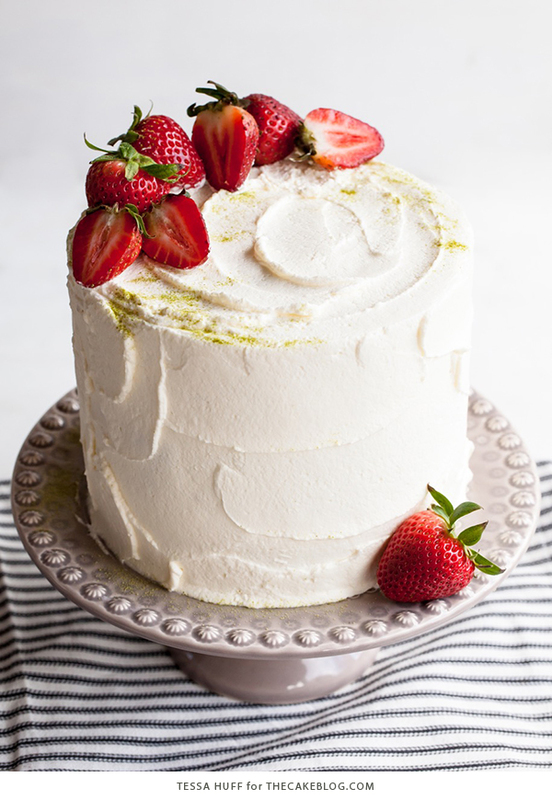 I wanted to frost the cake with something that was not going to weigh down the delicate sponge or subtle matcha flavor, but plain whipped cream is sometimes a bit too light and unstable. Mixing some softened cream cheese with sweetened whipped cream was the answer! Not only does the cream cheese add fabulous, tangy flavor, it “bulks up” the whipped cream and even stabilizes it enough to frost the cake without headache. Try it – it’s amazing!! Top with fresh berries and there you go! I bet you could also use raspberry jam with fresh raspberries if you’d prefer. Pre-heat oven to 350 degrees. Grease and line the bottoms of three 6-inch cake pans with parchment and set aside. Sift together the flour, matcha, and salt. Set aside. Place the whole eggs and sugar in the bowl of an electric mixer and whisk to combine. Fill a medium saucepan with a few inches of water and bring to a simmer. Place the mixing bowl on top to create a double-boiler. Whisking intermittently, heat the egg mixture until it reaches 100 degrees F on a candy thermometer. Once warmed, transfer the mixer bowl back to the mixer. Using the whisk attachment, beat the egg mixture on medium speed. Add the cream of tartar and bump the speed up to high. Continue to whip until the mixture becomes pale in color and triples in volume, about 8 minutes. Remove the bowl from the stand mixer. Sift the dry ingredients over the top of the whipped eggs. Using a large rubber spatula, gently fold in the dry ingredients taking care not to deflate the batter. Once fully incorporated, mix about a cup of the batter with the melted butter and vanilla in a separate bowl. Fold the butter mixture into the batter until thoroughly combined – again, taking care not to deflate the batter. Evenly distribute the batter between the prepare pans and bake for about 25 to 28 minutes, until the cake springs back to the touch (or a toothpick inserted in the center comes out clean). Cool on a wire rack before removing the cakes from their pans (see notes). 1 vanilla bean, seeds scraped. Add all of the ingredients, including the scraped vanilla bean pod, to a saucepan. Bring to a boil, then low the heat to a simmer. Continue to simmer for about 8 to 10 minutes, or until slightly thickened. Using an electric mixer or by hand, mix together the cream cheese and sugar until smooth. Using the whisk attachment, whip the cream until medium-soft peaks (do not over-mix!). Working in batches, begin folding a small portion of the whipped cream to the cream cheese mixture to lighten it up. Add the cream cheese mixture back to the rest of the whipped cream. Add the instant milk powder and fold until combined. The mixture should thicken up to a texture that can be used as frosting, but still light and fluffy. Chill before using, if necessary. Trim the cakes until even, if necessary. Generously brush the vanilla bean simple syrup on each cake (they can handle a lot, try to use up as much syrup as possible). Place the bottom layer of cake on a cake board or serving dish. Spread on a layer of strawberry jam. Carefully spread on about 1/2 of cream cheese whipped cream on top of the jam and top with the next layer of cake. Repeat. To prevent over-working the frosting, use a piping bag to apply the cream cheese whipped cream to all sides of the cake. Use an off-set spatula to even out the frosting and smooth until desired. 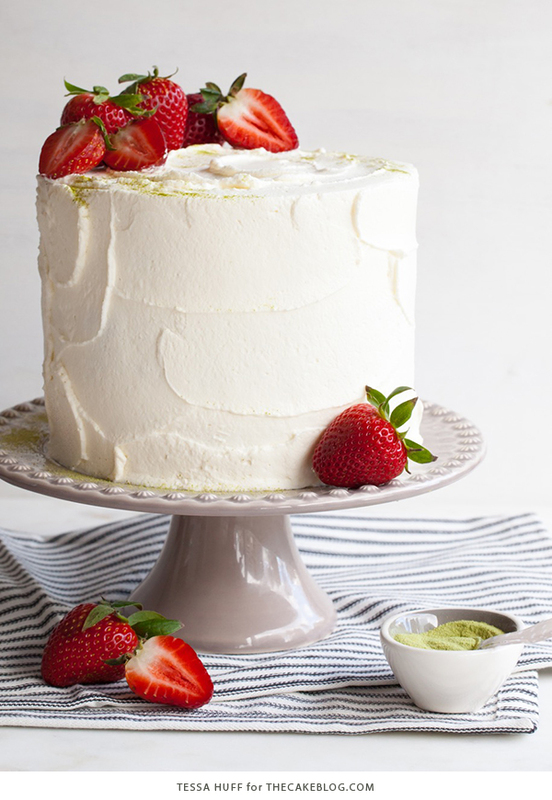 Top the cake with fresh berries and sprinkling of matcha powder. For the batter, really take the time to allow the eggs to whip and increase in volume. Take care not to deflate the batter when folding in the dry ingredients and butter. However, if not incorporated enough, the butter may sink and make the bottoms of the cakes dense. 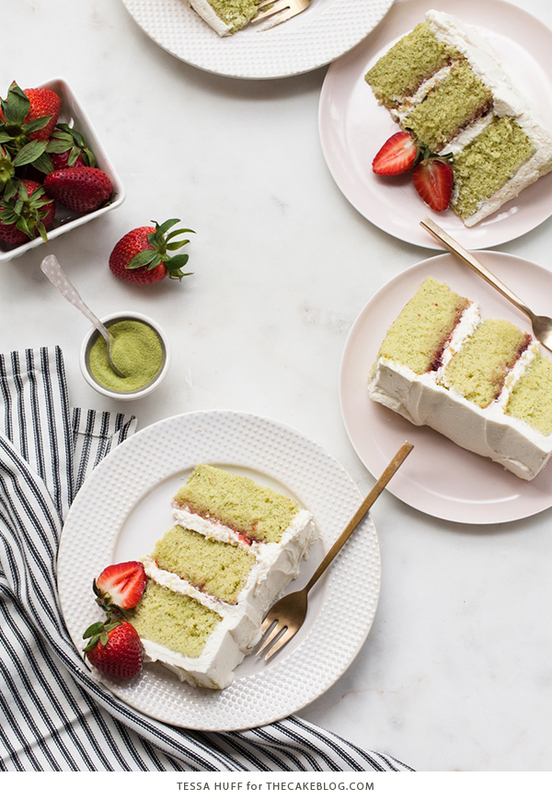 Depending on the brand of matcha powder, the color of cake may vary. The addition of instant milk powder to the frosting adds stability. i love strawberry and matcha together! i think the earthiness of the matcha pairs really well with the sweet/tart berries. Looks delish..may I ask what the tartar is for? And is there a substitute for it? This cake looks beautiful! I have a few concerns about Matcha. I recently tried a matcha latte at a Starbucks. It tasted fine for the first few sips but then started tasting fishy. Is that common with matcha or is there a particular brand you recommend. 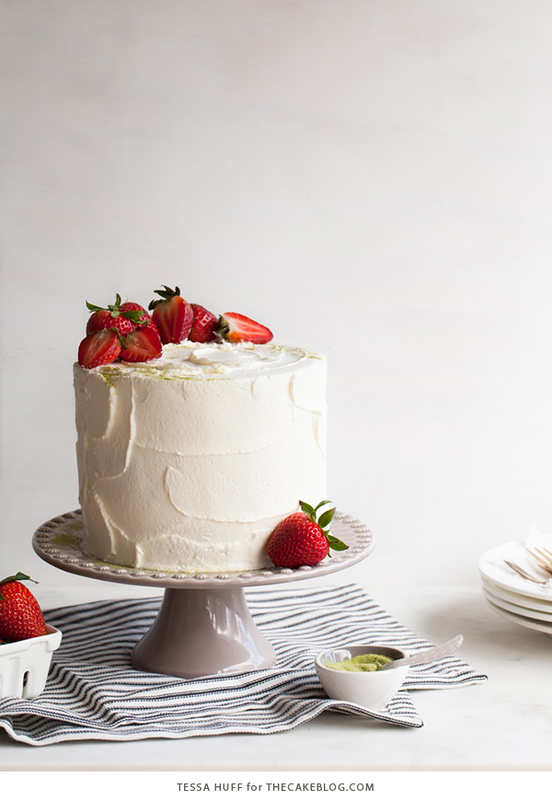 The matcha flavor was too strong for us with this cake. Beautiful and easy to make just not a matcha tea fan I guess. 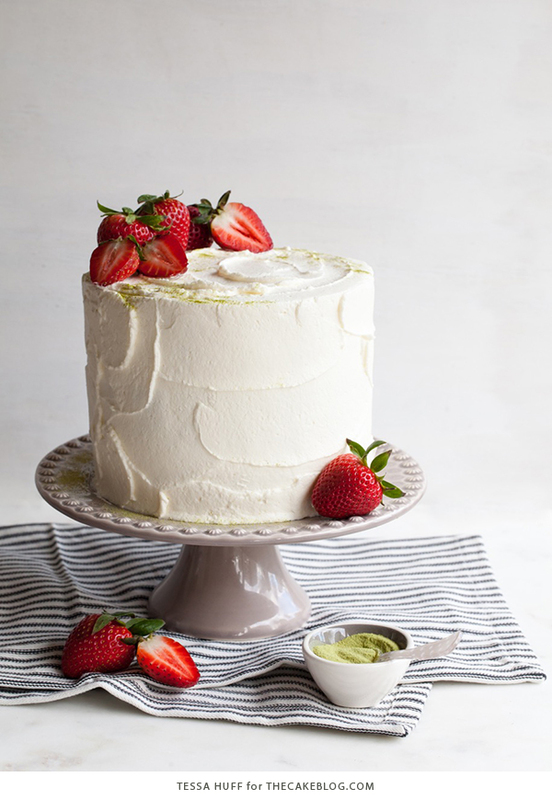 If you like matcha or green tea, you will love this cake! I am really tempted to try your recipe! Who could say no to more cake! This looks amazing and I can’t wait to try it. I always look forward to new ideas. Thanks for sharing! For my birthday my friends and I made a test batch of this cake as cupcakes and a final product cake. The cupcakes we just put in liners and baked at 350 degrees for 15 mins and they were perfectly done. I must say the cake is rather dense; even though I am usually fine with dense cake, I thought it did not pair well with a fluffy icing. However, both the icing and the cake tasted very good and the flavors went together very well. It was more of a texture and weight I did not appreciate. The vanilla bean did not soak into the cake as much as I was wanting, and I think it made me use less of the syrup because I didn’t want a layer on the cake before I put the jam down. I choose a jam that wasn’t too sweet so all of the flavors of the cake could come out. I thought that there could have been a bit more of a matcha flavor, and I do not like matcha lattes, so that was a surprising realization. Overall, I would definitely make this again but maybe experiment a bit more and make cake changes to: make the cake less dense and the syrup maybe thicker.